The company in question stated that their webbing based apparatus could stop a forklift of 10,000lbs traveling at 4mph. Upon inspection of the guard, we noticed several flaws that we have already improved upon in our loading dock safety gates. Now, we are comparing a webbing-based product which has two bollards. The product itself is honestly a closer comparison to our loading dock safety nets on bollards, but it was the only one who claimed to protect and stop a forklift. 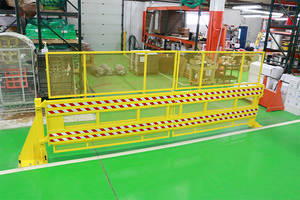 We designed and tested our Post Mounted Loading Dock Safety Nets to withstand a forklift traveling at 4mph. In fact, at US Netting we have several products that are tested to withstand the blow of a 10,000 lb forklift. We have engineered, tested and re-engineered our bollards and the net system to be sure to withstand a beating. The Defender Gate Ultimate was slammed seven times with a 13,000 lb. Forklift until it gave out. Not all of the dock safety companies claimed to stop a forklift. One comment that each company agreed upon was that the dock safety chain is now obsolete. 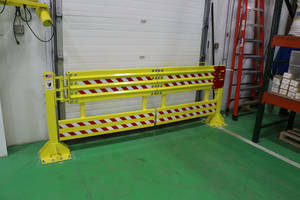 The safety chain is no longer sufficient as a protection device when on a loading dock. Anytime that you have a drop of 48" or higher you must have a barricade of some sort. The rail, gate, or protective barrier needs to be at least 42" high that can withstand 200lbs. Of force. (according to the Occupational Safety and Health Administration). That's where our Defender Gate and Loading Dock Safety Net products come in handy. Make your loading dock the safest in the world with products that can stand the test of time and take a beating from employees and machinery. The gates glide open smoothly with EasyGlide Technology and contain a locking latch for added security. 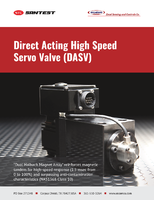 As we continue to sell our products, we are constantly re-working in the feedback from our customers making progressive tweaks to our end products that make them safer for our users. One of such advances was the additional add-on or "Plus" rail for the Defender Gate Ultimate. The Defender Gate Ultimate Plus is built here in the USA with an additional lower guardrail to stop employees and stock from going underneath the gate yet still maintaining the super strength of the Defender Gate Ultimate. 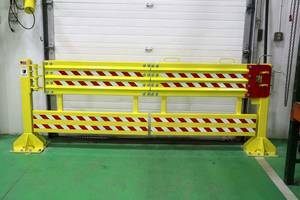 Several of our customers were in need for a product that didn't just stop forklifts but also from anyone or thing getting underneath the gate. Safety is the number 1 concept that we focus on at US Netting so if you have any issues or concerns we'd love to hear them sales@usnetting.com. Another question we get often is: "Why don't you offer an automatic gate?" Number one, loading docks are fast-paced and used hundreds of times daily. 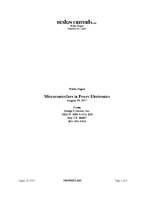 Electronic components are known for going bad and need special considerations when faced with the elements. 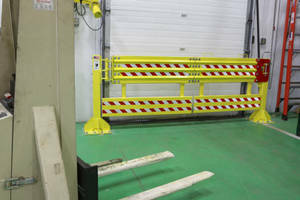 Second, the operation of an automatic gate typically involves large electric modules or hydraulics that can get in the way or pose threats of their own in the workplace. In short, we just want our gates to operate longer than your building remains standing. We can maintain that our gates will last the longest by our hand made all steel construction, and lengthy QA process focused on making sure that each gate that comes out of our facility has already been installed and is functional. When the competition is saying that the chain is obsolete so you should replace it with one of their gates they are telling you to purchase something that is a "little" bit better. 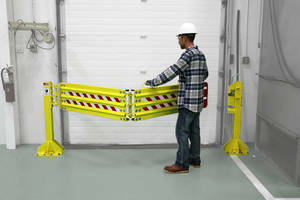 Why not protect your workers with the toughest gate available on the market today. The one and only tested and constructed to withstand the beating of a forklift. Make your loading dock the safest in the world today with the Defender Gate by US Netting.